Winners of the 2017 and 2018 Tuskegee Airmen Awards pose for group photos at the Military Diversity Luncheon in Las Vegas, Aug. 9, 2018. Master Sgt. Demetrius, 432nd Wing inspection superintendent, has demonstrated the spirit of the Tuskegee Airmen and wishes to continue helping people recognize and overcome the various challenges they are faced with. In September 1940, the Tuskegee Institute began training African American pilots who would go on to fly more than 15,000 sorties during World War II, destroy or damage 273 German planes, and inspire the integration of U.S. armed forces. Today, outstanding Airmen are recognized with the Tuskegee Airmen Incorporated military awards named after previous Tuskegee Airmen who distinguished themselves despite the adversity they faced during their time in service. One Creech member had the distinct honor of receiving the 2017 Senior Master Sgt. Margaret Frances Barbour Award and was recognized at the 2018 Military Diversity Luncheon in Las Vegas, Aug. 9, 2018. Master Sgt. Demetrius, 432nd Wing inspection superintendent, shared that he enjoys contributing to the Remotely Piloted Aircraft enterprise, getting involved in the local community and mentoring future Airmen. 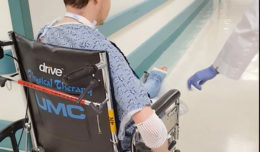 “When you’re doing things for people and trying to help them out, it’s not about what you can get out of it, but what they can get out of it,” Demetrius said. Master Sgt. Demetrius, 432nd Wing inspection superintendent, and his son speak with Nancy Colon, an original Tuskegee Airman, at the Military Diversity Luncheon in Las Vegas, Aug. 9, 2018. Demetrius was presented with the 2017 Senior Master Sgt. Margaret Frances Barbour Award by members of Tuskegee Airmen Incorporated. Demetrius has not only performed exceptionally in his day-to-day duties but has consistently ventured outside his scope of military service. One of Demetrius’ personal accomplishments is gathering inspirational people and talking to youth once every two months at the community juvenile detention center, he explained. 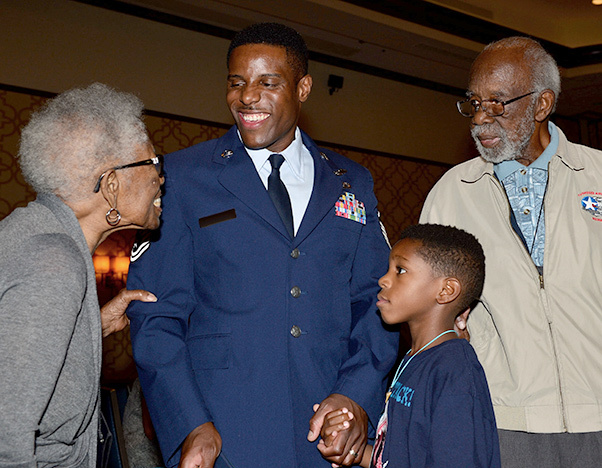 Though he takes time to help those in the Las Vegas community, Demetrius said he also enjoys guiding first-term Airmen in discovering their limitations or even just lending a hand to a stranger with a flat tire. “My biggest motivation is to inspire togetherness, understanding and respect for one another,” Demetrius said. 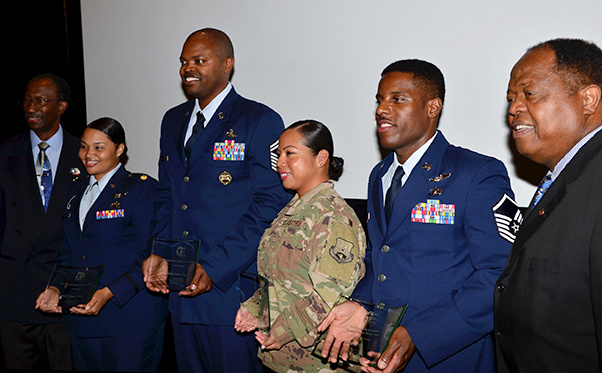 Regardless of race, color, origin or gender, the Tuskegee Airmen Awards are presented to remarkable Airmen who have dedicated themselves to being a mentor in their local and U.S. Air Force communities. Master Sgt. Demetrius, 432nd Wing inspection superintendent, poses with his wife, son and daughter after receiving the 2017 Senior Master Sgt. 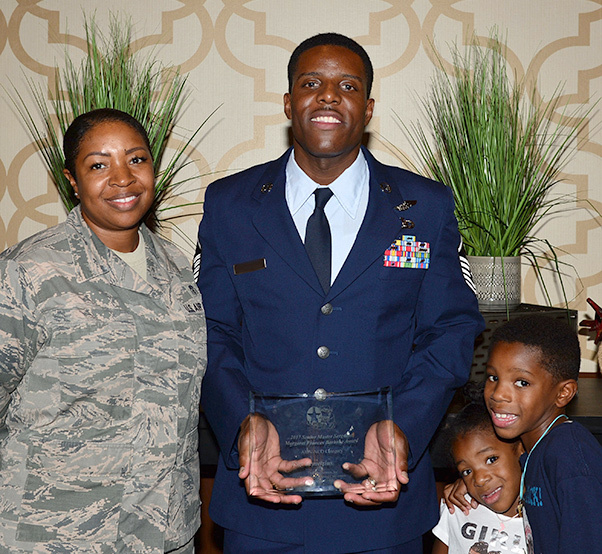 Margaret Frances Barbour Award at the Military Diversity Luncheon in Las Vegas, Aug. 9, 2018. These awards were named after Tuskegee Airmen and those who receive them uphold the passion, determination and innovation of the Airmen who flew before them. Those who were honored uphold the passion, determination and innovation of the Airmen who flew before them. The Tuskegee Airmen were part of a movement that altered the military and the world’s perception of minority service members, and not only overcame adversity, but proved through their unwavering courage that prejudice has no place in the military. Demetrius has already demonstrated the spirit of the Tuskegee Airmen in his everyday life and plans to continue his efforts in helping people recognize and overcome their challenges. Master Sgt. 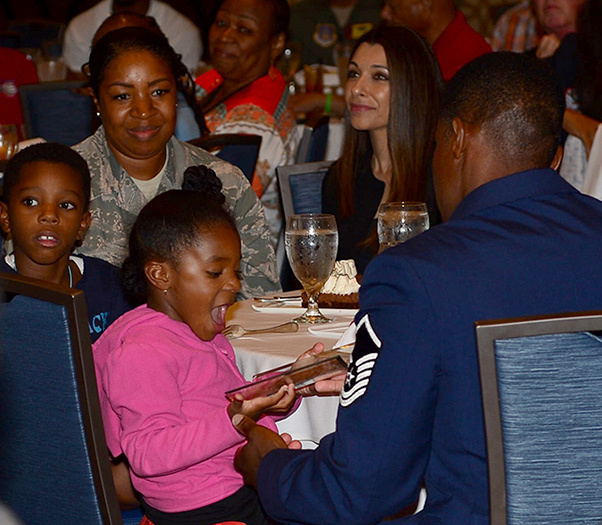 Demetrius, 432nd Wing inspection superintendent, shows his award to his daughter at the Military Diversity Luncheon in Las Vegas, Aug. 9, 2018. Demetrius received the 2017 Senior Master Sgt. Margaret Frances Barbour Award for his dedication to the Remotely Piloted Aircraft enterprise, being involved in the local community and mentoring future Airmen.